The alarm on my phone beeps, indicating there is 30 minutes before the event begins. I push the silence button. There is too much silence – there is dust gathering on the turrets of a pink castle, the home to my daughter’s toy dolls. A pile of clothes lies forgotten in my son’s bedroom. He has outgrown most of the clothes without even wearing them. A frying pan sits on the stove, it is a pool of blackness where meat once sizzled, and fried rice sauteed in fragrant spices. I close my eyes, and sleep in silence. There are no children to tell bedtime stories to, or say prayers together. I wake up to silence. There are no children to make breakfast for. No children to help get ready for school. Their clothes go unused in the dresser, as time passes, the color fades and the clothing goes out of style. The home that was once filled with the happy laughter of children is now silent. My kids were looking forward to attending a special event at church. This event is held only once a year, and when my children saw a flyer about it they were excited to go. We had been planning this event for months. The event is also special because it would allow my kids to volunteer, and help people in need. Due to the abusive and controlling behavior of Mr. X, my children will not be visiting me today, and will not be attending the event. I can not go to the event alone, and without my children… my heart is thudding in my chest as I write, trying to resist the sadness that is racing through my bloodstream, threatening to consume me. No matter how strong I try to be, or how optimistic, there is always a current of grief in my life – the aching loss of my children. Emotional and psychological abuse is like a throwing a punch that can be felt miles away, inflicting bruises without physical contact. The emotional abuse started as soon as Mr. X discovered that I wanted to attend this event with the children, and that the children were looking forward to it. Since Judge Robben limited my parenting time to just one visit a month, Mr. X has complete and total control of when I see my children outside of that one visit. Judge Robben justified the one visit a month, and said it meets the statutory minimum of parenting time (it does not!) because Mr. X does allow some additional parenting time. Judge Robben is basically empowering Mr. X to continue to abuse me (Domestic Violence by Proxy), and to subject the children to emotional and psychological abuse as well as the intentional deprivation of their mother. My children now suffer from severe, and debilitating, emotional and behavioral problems and will likely be scarred for life. This is what Mr. X does, how the emotional abuse manifests – I will write an e-mail or leave a text messages (he does not talk to me on the phone, and will not answer calls or return messages) asking for additional parenting time. Mr. X will refuse to respond. Weeks will go by with no answer. As the time of the event nears, I will try again to ask if the kids can come to the event. Every time my phone signals a text message, I am on high alert hoping… I scan my e-mail in anticipation but the inbox is empty. The excitement and hope of seeing my children is followed by rejection, and the silent treatment. I struggle against associating hope with pain. My children have given up, and basically assume that they will not see me, and have stopped looking forward to coming home (this is a symptom of parental alienation). Mr. X will finally get back to me — usually at the last minute. In this case, he said that my children could come to the event, and told me that I can have them for a visit on Saturday. Then Mr. X refuses to give me a time for when I can pick the kids up. This will go on for several more days — ignoring my text messages, no response or communication, and so I cannot plan an even or even count on seeing the children. One simple request to have additional parenting time has stretched out to a week of Mr. X playing mind games, and inflicting emotional abuse. My nerves are frazzled. I alternate between hoping I will be able to see my children, and giving up. I can never really give up, these are my babies. I can not imagine what my children are experiencing, and can do nothing to protect them from this emotional assault. After about 5 days of this mental torture — torture because the love you have for your children, and the excitement of seeing them is being used as a weapon to hurt you — Mr. X will text me back but his answer is vague or noncommittal. Still no plans are set. Mr. X then tells me that my oldest son DJ has other plans for the day. This is an alienation tactic – encouraging the child to attend other events during scheduled parenting time with the targeted parent. Another thing Mr. X does is make the plans so complicated that I cannot comply with his requests. In this instance, Mr. X was asking me to do an extraordinary amount of driving to meet his various requests, the driving Mr. X asked me to do would total to about 2 1/2 hours of my visit. When I offer a compromise, or ask for something different, Mr. X either refuses to respond or refuses to work with me. And in the end I have to comply to his ridiculous, and harmful requests in order to see my children. Or not see my children at all. When I asked for a compromise Mr. X refused to respond at all. In silence I watch the clock tick by, minute by minute there is no reply. And I will not see my children today. There is no answer or explanation for this. Only silence. And I know my children are hurting, and wondering what happened. Wondering why Mom did not come to pick them up. Wondering why they cannot go to the event. They have been waiting for weeks to go to the event… and there is no answer. I cannot talk to my children. Or hug them. Or explain why. Mr. X is inflicting real pain and suffering on my children. And the Hennepin County Family Court, along with Judge Robben and GAL Jamie Manning, is allowing this abuse to continue. I am grieving the loss of my children today. I spent the whole week preparing and cannot see them. My fridge is full of food for the dinner I wanted to make. And my heart is full of tears for what could have been. I miss my daughter’s smiling face, and sarcastic humor (so much like mine!). I miss my son showing me video games, and singing to Monstercats. I miss the kids playing together. I miss being a mother. I will never get over this loss. I will never move on. 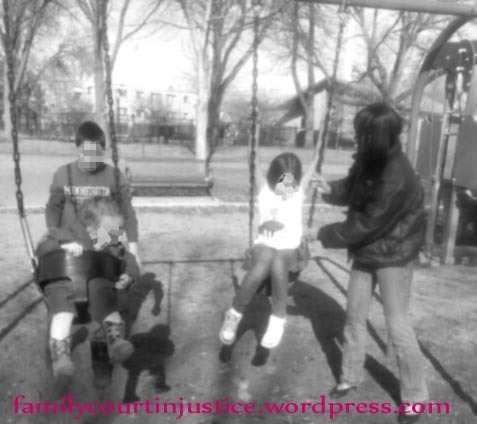 I will fight with all my strength for justice in the family courts. No child should be forced to live without one parent. And no child should be forced to live in an unsafe or dysfunctional home. I am a fit, loving parent who just wants to be a mother to my children. 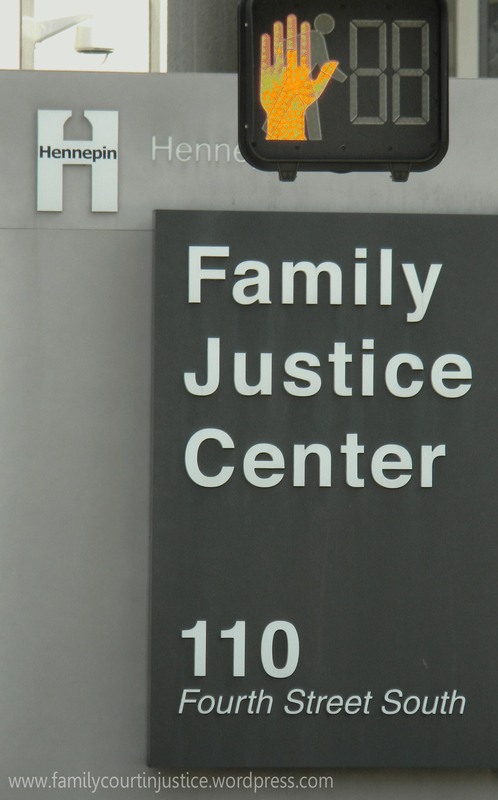 Hennepin County Family Court will not allow that to happen – instead of preserving the family, the Court is destroying mine. A Protective Parent is a fit, loving parent who has lost custody of a child due to injustice and systemic failures in family court. 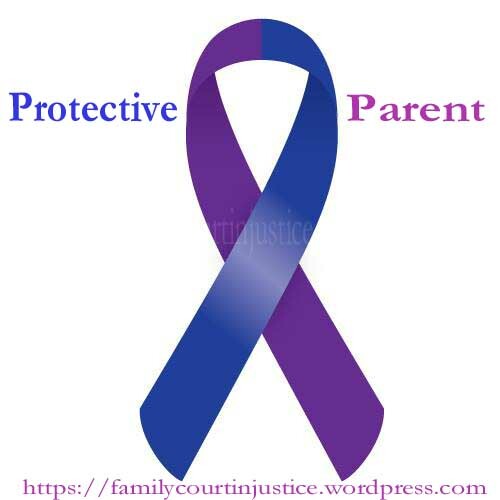 Protective Parents are called “protective” because they are punished by the family court for raising concerns about domestic violence or child abuse. Protective Parents who lawfully work to keep their children safe, and work to maintain a presence in their children’s lives despite the enormous challenges against them. The blue ribbon is for child abuse awareness, the purple ribbon is for domestic violence awareness. This ribbon is not associated with any group, organization, political or religious cause.. it is my own design. This entry was posted in Abuse Allegations & Documentation, Child Abuse, Family Court Injustice, Judge Robben, Our Family Albulm, Parental Alienation/DV by Proxy and tagged child custody, Co-Parenting With An Abuser, domestic violence and custody, domestic violence by proxy, DV By Proxy, Emotional Abuse, family court, family court injustice, Family Justice Center, Grief and Loss, Hennepin County, Injustice, Judge Robben, Loss of Child, Maternal Deprivation, memoir, Motherless Child, Parental Alienation, Protective Parent, Psychological Abuse, Targeted Parent. Bookmark the permalink. My heart feels your pain….How long have you been enduring this? 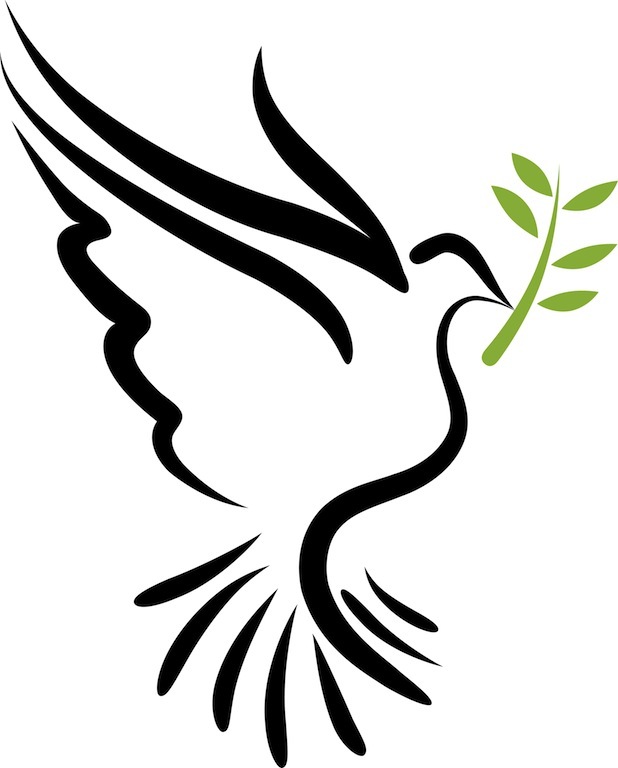 Many hugs and prayers…..
My heart aches for you! I will be praying for you and your children. The court system is unfair in so many ways and I pray for changes so things like this will not happen. Reblogged this on julian's justice journal. I’m fighting the same battle. I want to help in any way I can. What’s happening in the legal system is wrong. Judges are untouchable and attorneys are scared to take action for fear of being sanctioned. The system is build on corruption and money not children’s best interests. Please contact me. I am praying for us both. Thank you for this blog.